Former world number one Rafael Nadal has confirmed he will return from knee trouble in the Mubadala Championship in Abu Dhabi from 27-29 December. Nadal has had a partial tear in his patella tendon and has not played a match since June when he lost to Czech Lukas Rosol in round two at Wimbledon. But on Tuesday he wrote on his Facebook page: "Can't wait to get back on court in Abu Dhabi at the end of the month. "I won in 2010 and 2011 - would love to get my hands on the trophy again!" The 26-year-old Spaniard, now ranked fourth in the world, has struggled with knee problems in the past and was unable to defend his Wimbledon title in 2009 because of tendonitis. He secured a record seventh French Open title in June and has won a total of 11 Grand Slams, but missed the Olympics and the US Open. Last week he was cautious about rushing his comeback. "I will only come back when I am fit. 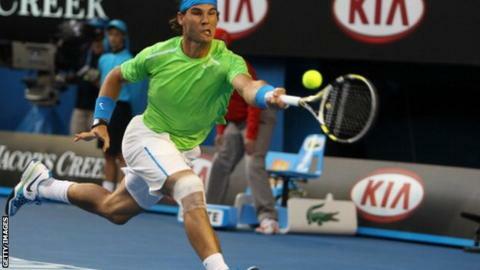 I won't come back worrying about my knee," he told Spanish radio station Onda Cero. "The results will not worry me in the first tournaments back. We are in the last stage of the recovery and I want to recover as soon as possible but I will not rush back and then have to stop again in six months or a year's time."